If the effect of a "Wind-Up" monster is activated, except "Wind-Up Magician": You can Special Summon 1 Level 4 or lower "Wind-Up" monster from your Deck in face-up Defense Position. This effect can only be used once while this card is face-up on the field. This card is featured in Zenmairch. 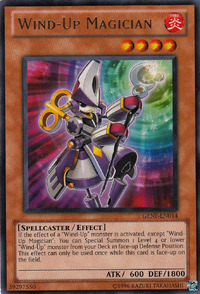 This card seems to be based on Arcanite Magician, as their staves are nearly identical, as well as their color scheme. This is the second Wind-Up monster to become Limited, after Wind-Up Carrier Zenmaity.